Your home's exterior really takes a beating. Give it an occasional cleaning to brighten up its appearance, get rid of mildew, and prevent discoloration. Sounds like a good idea, right? Well, have we got a tool for you! Think your wood siding needs a fresh coat of paint? Maybe. Or it could be that your wood clapboard, lap, or shingle siding simply needs a thorough cleaning. Homeowners have always prized wood for its unparalleled appearance, but like any siding material, it requires periodic maintenance. With wood in particular, the challenge is to avoid doing more harm than good. For instance, you might be tempted to clean wood siding with a pressure washer, thinking it would make quick work of things. Do so at your own risk. Using such a high-powered tool can actually cause several types of damage, including stripped paint, gouged boards, and loosened caulk. Plus, if the pressure washer manages to send water through the joints and behind the boards, the errant moisture could end up fostering mold growth or triggering wood rot. In short, unless you’re deeply familiar with the operation of a pressure washer, don’t point one at the most visible part of your home. Besides, if you really want to give new life to your wood siding, it’s likely that water alone won’t do the trick—you’ll need to scrub too. A full-featured garden hose attachment like the HYDE PivotPro Outdoor Cleaning Wand includes everything you need to achieve a satisfying, beautiful result. Read on to learn how to clean wood siding safely and effectively with a single tool. Though far gentler than a pressure washer, PivotPro is broadly similar, in the sense that it releases a steady, directed stream of water. So, before you begin cleaning the siding in earnest, take steps to protect anything that would be vulnerable to a spray of water. If your landscaping includes delicate foundation plantings, it may be wise to cover them all with plastic sheeting. Do the same for any electrical components mounted on the siding (for example, power outlets and light fixtures). Also, do the obvious thing: Shut all the windows. As you go about your preparations, keep an eye out for mold. Dirt can be unsightly, but mold can be truly problematic. Left unchecked, it often causes wood rot, particularly in wet, humid climates. Note any location where you discover mold, so you return to and concentrate on those spots later in the cleaning process. Point your PivotPro, hit the trigger, and start spraying cleansing water against your dirty wood siding. Work down from the roofline, taking on one 10-foot-square section at a time. 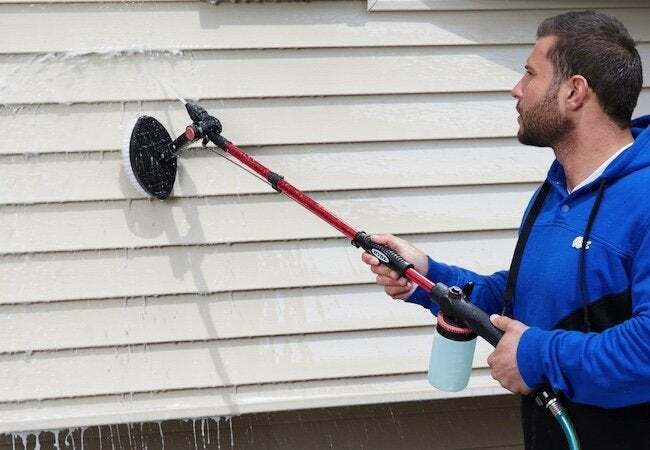 At 46 inches in length, the PivotPro greatly extends your reach, even allowing you to spray second-floor siding without the hassles and hazards of using a ladder. In fact, PivotPro never forces you out of your comfort zone. Its pivoting nozzle allows you to spray at virtually any angle, so you can attack grit and grime in corners and crevices, all while remaining on your own two feet—no bending, stretching, or stooping required. If you encountered any mold during the initial spraying, you’ll need to take action. Whether homegrown or store-bought, there are a number of methods of eliminating mold. Many people swear by the mold- and mildew-fighting capabilities of white vinegar, while others recommend oxygen bleach (not to be confused with chlorine bleach). Another option is to shop your local home center for a specially formulated mildewcide. Whichever cleanser you choose, it can be added to the 16-ounce mixing reservoir built into the PivotPro. Just pour in your cleanser of choice, set your desired cleanser-to-water ratio, then spray the mildew treatment wherever you need it. Finished? Deactivate the cleanser infusion with the push of button. Note: In order to be effective, most mildew treatments must sit for a period of time before being rinsed away. If you encounter stubborn dirt or mold, don’t fret: PivotPro comes with precisely what you need to get rid of stuff that simply won’t budge. For flat surfaces, opt for the adjustable stiff-bristle nylon brush preloaded onto the tool. 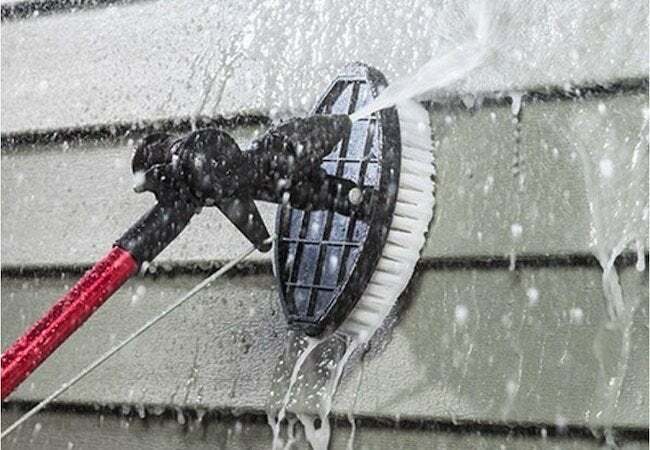 When you need it, simply swing the brush into place and scrub the siding as you spray it down. Do you need to scrub a narrow area, perhaps around the edges of a trim detail? Switch out the regular scrub brush for the spindle brush, also included. This attachment lets you clean cramped crevices where even hands can’t easily fit. When you’re done with the PivotPro brush, swing it back up and out of the way again. Finish up by rinsing off any section to which you applied mildew treatment. If you used only water throughout the process, then you can consider the task complete once you have sprayed down the entire home exterior. Depending on the condition of the house when you started, you may notice the difference immediately. As you bask in the glow of a job well done, promise yourself to perform a similarly thorough cleaning on an annual basis to ensure that your siding always presents an appearance you can be proud of. Even more important, continued maintenance goes a long way toward ensuring your siding continues to serve you for many years.